The Wollman lab measures, models, and manipulates signaling activities at the single-cell level to understand Dynamic Cellular Information Processing. We strive to understand cellular decision-making, biological variation, and biological noise using multidisciplinary approaches. Measure: We develop methods in single-cell fluorescence microscopy in combination with computational image analysis to evaluate the distribution of cellular responses in real-time. The resulting high-throughput datasets are quantified using computational data analysis and interpreted using advanced statistical methods. Model: We use mathematical modeling based on signaling pathway mechanisms to infer and predict the details of mechanistic cellular signaling. Manipulate: We experimentally investigate a cellular signaling system by manipulating the internal and external cellular environment both spatially and temporally at the single-cell level. 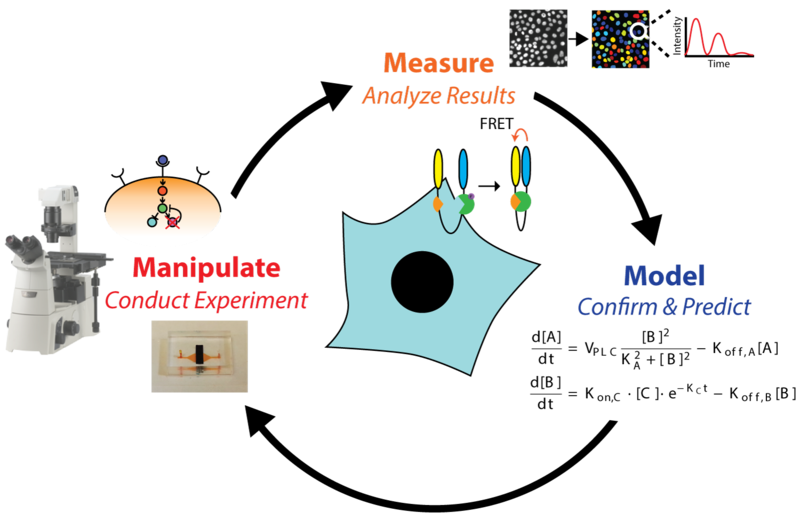 Specific approaches include microfluidic devices, genetic and pharmaceutical perturbations, and optogenetics.